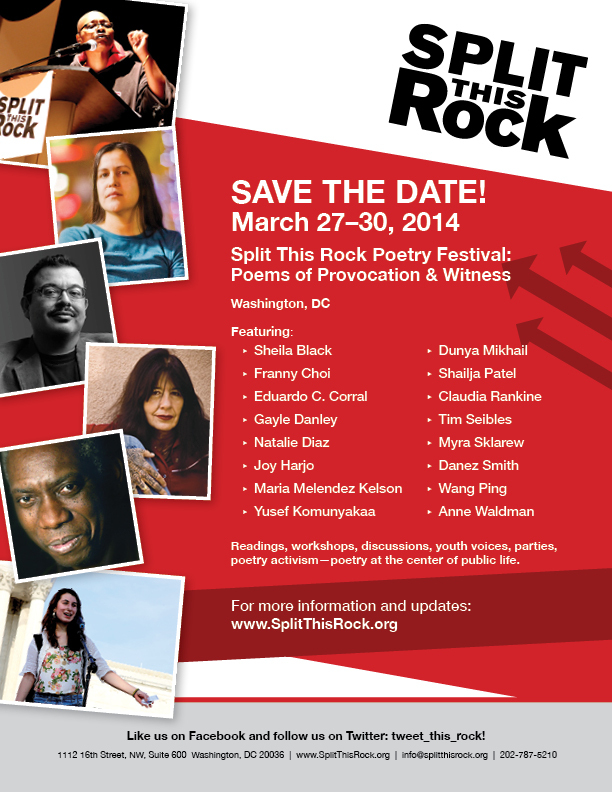 Split This Rock is pleased to announce the 16 poets who will feature at the fourth national biennial Split This Rock Poetry Festival: Poems of Provocation & Witness in Washington, DC, March 27-30, 2014. Among the most significant and artistically vibrant writing and performing today, they also exhibit exemplary public citizenship as activists, teachers, and supporters of marginalized voices. The poets to be featured are Sheila Black, Franny Choi, Eduardo C. Corral, Gayle Danley, Natalie Diaz, Joy Harjo, Maria Melendez Kelson, Yusef Komunyakaa, Dunya Mikhail, Shailja Patel, Wang Ping, Claudia Rankine, Tim Seibles, Myra Sklarew, Danez Smith, and Anne Waldman. They represent the great diversity of poets writing and performing in the United States today: poets writing in all poetic styles, men and women of many races, ethnicities, sexual orientations, ages, and social classes. Split This Rock Poetry Festival is DC’s premiere poetry event and the only festival of its kind the country, highlighting poets working at the intersection of the imagination and social change. The festival features readings, workshops, panel discussions, youth programming, activism—opportunities to speak out for justice, build connection and community, and celebrate the many ways poetry can act as an agent for social change. Registration will open in the fall of 2013. Sheila Black is the author of House of Bone, Love/Iraq, and Wen Kroy and co-editor of Beauty is a Verb: The New Poetry of Disability. A 2012 Witter Bynner Fellow, she lives in San Antonio, TX, where she directs the literary arts center Gemini Ink. Franny Choi has been a finalist at the National Poetry Slam, the Individual World Poetry Slam, and the Women of the World Poetry Slam. She co-coordinates ProvSlam Youth, a program for young writers in Providence, RI. Eduardo C. Corral’s first book, Slow Lightning, won the 2011 Yale Series of Younger Poets competition. The recipient of a Whiting Writers’ Award and a National Endowment for the Arts Fellowship, he currently lives in New York City. Gayle Danley won the 1994 National Individual Slam Competition. She maintains a constant tour of elementary and secondary schools, helping students with traumatic experiences and teaching workshops on Slam poetry to all age groups. She lives in Baltimore, MD. Natalie Diaz’s first book, When My Brother Was an Aztec, was published in 2012 to much acclaim. She lives in Mohave Valley, AZ, and directs a language revitalization program at Fort Mojave, her home reservation, working with the last Elder speakers of the Mojave language. Joy Harjo is an internationally known poet, performer, writer, and saxophone player of the Mvskoke/Creek Nation. Her most recent books are a memoir, Crazy Brave, and a collection of conversations, Soul Talk, Song Language. She writes a column, “Comings and Goings,” for her tribal newspaper, the Muscogee Nation News and lives in Glenpool, OK.
Maria Melendez Kelson has published three poetry titles, most recently Flexible Bones. She lives in Pueblo, CO, where she teaches at Pueblo Community College. Her nonfiction appears in Ms. Magazine, and Sojourns, among other venues. Yusef Komunyakaa’s seventeen books of poetry include Taboo, Dien Cai Dau, Neon Vernacular, for which he received the Pulitzer Prize. His plays, performance art, and libretti have been performed internationally and his prose is collected in Blues Notes: Essays, Interviews & Commentaries. He teaches at New York University. Dunya Mikhail is an Iraqi-American poet who left Iraq in the 1990s when her work as a journalist for The Baghdad Observer was found “subversive.” Her first book in English, The War Works Hard, was shortlisted for the Griffin Prize and Diary of A Wave Outside the Sea won the 2010 Arab American Book Award. A new book of poetry, The Iraqi Nights, is forthcoming in 2014. She lives in Michigan. CNN calls Shailja Patel “the people-centered face of globalization.” An internationally acclaimed Kenyan poet, playwright, public intellectual and activist, her performances have received standing ovations on four continents. Her first book, Migritude, was an Amazon poetry bestseller and a Seattle Times Bestseller. She divides her time between Kenya and Berkeley, CA. Wang Ping was born in Shanghai and came to USA in 1986. She is the founder and director of the Kinship of Rivers project, which builds a sense of kinship among the people who live along the Mississippi and Yangtze Rivers. Publications include short story collections, novels, and the poetry collections Of Flesh and Spirit and The Magic Whip. She teaches at Macalester College in St. Paul, MN. Claudia Rankine is the author of four collections of poetry, most recently, Don’t Let Me Be Lonely, a multi-genre project that blends poetry, essays, and image. She is also the author of a play, Provenance of Beauty: A South Bronx Travelogue, which is performed on a bus ride through the Bronx. She lives in southern CA, where she teaches at Pomona College. Tim Seibles is the author of several poetry collections, most recently Fast Animal, a finalist for the 2012 National Book Award. A National Endowment for the Arts fellow, Seibles teaches at Old Dominion University and in the Stonecoast Writing Program at the University of Southern Maine. He lives in Norfolk, VA.
Myra Sklarew’s numerous collections of poetry include Lithuania: New & Selected Poems and Harmless.Forthcoming is A Survivor Named Trauma: Holocaust and the Construction of Memory. She was the founding director of the MFA Program in Creative Writing at American University and is professor emerita of literature. Past president of the Yaddo artist community, Sklarew is a key organizer of “A Splendid Wake,” a documentation project of poets and poetry activities in DC from 1900 to the present. Danez Smith works as a Student Advisor for the First Wave Hip-Hop & Urban Arts Learning Community at the University of Wisconsin-Madison. He has performed across the country in schools, community centers, poetry venues, and theatres, as well as to the UK, Mexico, Switzerland, and Panama. He is an assistant editor for Muzzle Magazine and edits the Line Breaks Chapbook Series for First Wave. The author of more than 40 collections of poetry and poetics, Anne Waldman is an active member of the Outrider experimental poetry movement. A recipient of a 2013 Guggenheim Fellowship and the Poetry Society of America’s Shelley Memorial Award, she has recently been appointed a Chancellor of The Academy of American Poets. Waldman co-founded with Allen Ginsberg the Jack Kerouac School of Disembodied Poetics at Naropa University, where she is a Distinguished Professor of Poetics. Full biographical information and photographs can be found at www.SplitThisRock.org.